Invest in the most secure way to protect your school's important notices and announcements! The school district has received a new emergency preparedness edict from a government agency. Where can you prominently display this important document, without compromising the document's integrity. The answer comes in the form of a durable and secure bulletin board called the Wood Framed Cork Board. Made with resilient, pebble-grained natural cork, the Wood Framed Cork Board has tempered safety glass doors that attached to self-closing hinges. You never have to worry about leaving the bulletin board inadvertently unlocked. The tumbler pin lock prevents vandals from breaking into the case and you have extra security since only a handful of trusted school personnel carry a key. 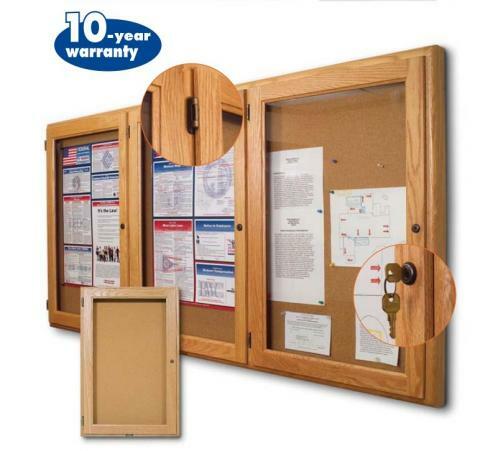 Thicker documents easily fit inside of the Wood Framed Cork Board because of the 1 3/8" depth. The perimeter is large enough to hold multiple paper sized documents and you can purchase more of the long-lasting boards. We construct the beautifully handcrafted Wood Framed Cork Board with solid oak wood to ensure durability.Every important announcement and notice now has a safe home!